-Blend all ingredients in blender with 1/3 cup water. If this mixture gets too thick add more water to reach a desired consistency. Bring to room temperature before using as it will be easier to work with. -Toss with vegan chicken wings and bake in oven at 350 F until crispy. Usually takes about 15 minutes. This recipe can also be fried in a pan with the sauce on a medium low heat until crispy and heated through. 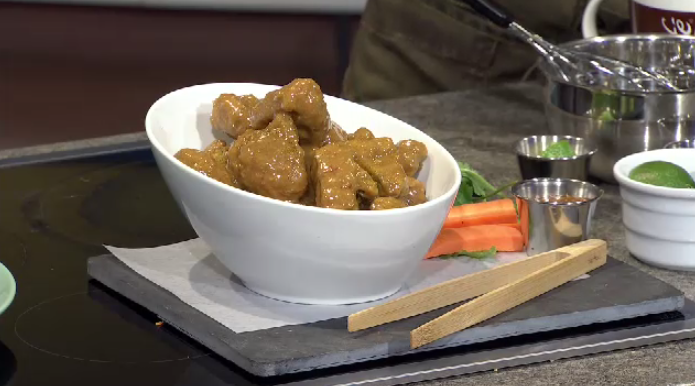 Real Fake Meats chef Lauren Marshall whips up some Thai spiced peanut butter 'chicken' wings in the CML kitchen.